This banana loaf turned out to be moist, light and unbelievably tasty. Super easy to make and absolutely delicious - a real keeper. There is no butter in this recipe. The addition of orange juice keeps the loaf moist and adds to the flavor. 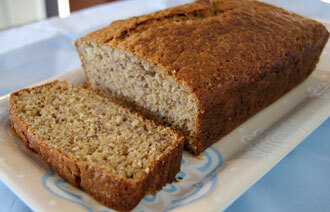 Substituting half the flour with whole wheat and adding raw sugar gives the loaf texture and ramps up the taste. 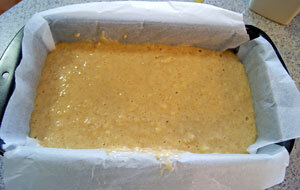 Prepare a 900 g / 2 lb loaf tin by either greasing or lining with baking paper. Sift the flours, baking soda and baking powder into a large mixing bowl. 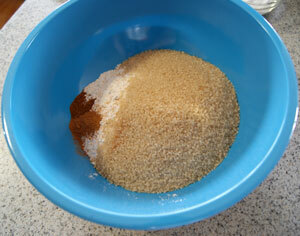 To this add the sugar, salt, cinnamon and nutmeg. You will need 2 large bananas or 3 smaller ones. Make sure they are ripe. This is a good way to use up your over-ripe bananas. Slice them into a bowl and mash with a fork or a potato masher. Mash them until they are quite soft and mushy. Add the orange juice and oil. 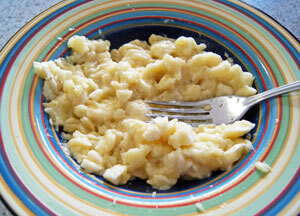 Lightly beat the eggs and add to the mashed banana. 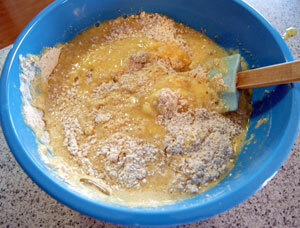 Make a well in the center of the dry ingredients and add the banana mixture. Gently fold through using a spatula until no streaks of flour are visible. Pour into the prepared loaf tin. The recipe stipulates a 900 g / 2 lb loaf tin. What size is this you may ask? This measures 23cm x 13cm x 7cm / 9 x 5 x 3 inches. Bake for 1 hour. Test for doneness by inserting a toothpick into the center. If it comes out clean the banana loaf is ready. If not return to the oven for a further 5 minutes and test again. Serve with yogurt and berries for a delicious breakfast. Pack into school lunch boxes. Serve with your favorite cuppa for a mid-morning or afternoon break.